We need to talk… This is a stunning poster, and I'm not even sure if it's real. 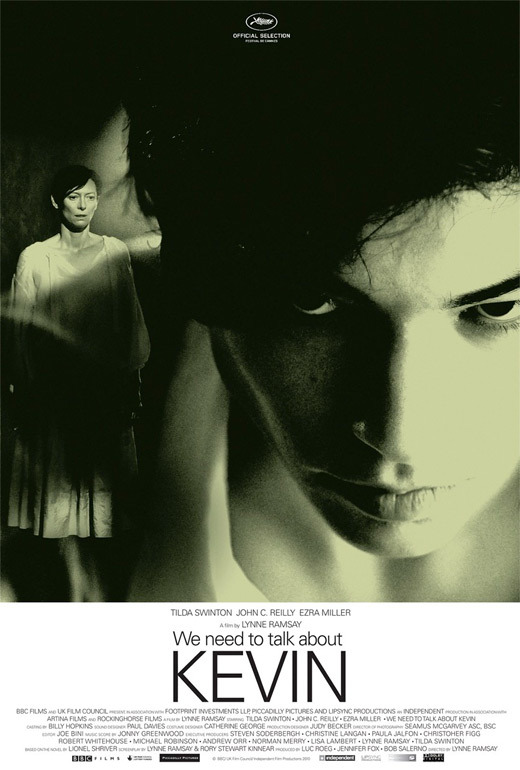 The Playlist recently revealed that a new poster was out for Lynne Ramsay's We Need to Talk About Kevin, the drama starring Tilda Swinton as the mother of a teenage boy that went on a school killing spree who tries to deal with her grief. We didn't feature the French trailer that recently hit the web for it, as we're waiting for an official one, but this poster is a good sign that this film is a lot darker and scarier than most are probably thinking. This design is pretty much lifted straight from the original Rosemary's Baby 1968 poster, but I still really like it. We Need to Talk About Kevin is the third film by BAFTA nominated Scottish filmmaker Lynne Ramsay, of the features Ratcatcher and Morvern Callar previously. The screenplay was written by Lynne Ramsay & Rory Kinnear, adapted from Lionel Shriver's 2003 novel of the same name. This first premiered at the Cannes Film Festival, and Oscilloscope Labs is distributing in the US. We Need to Talk About Kevin is set for a limited awards opening starting December 2nd this holiday season. Stay tuned for an official trailer! whenever i have to look at tilda swinton, its scary..
Is that David Bowie in the background? Yea, it's a bit weird... I think John C. Reilly is outta place, but Swinton is just a damn good actor, so it works. It's a very twisted, dark, creepy, odd film... but very worth seeing. tilda swinton is always excellent. i've never heard of this before now (thanks, alex!) but it's on my radar......sounds good. Kings of New York showed what an intense actor John C. Reilly can be, even outside of the hilarity that is Will Ferrell. I can't wait to see this movie! I read the novel recently and can honestly say that it's intense. I don't think you guys will be disappointed and I certainly expect to see Tilda Swinton on quite a few red carpets this awards season.